I blogged last week about the new-but-not-improved Senate Regulatory Accountability Act (RAA), focusing on how it would reinstate some of the worst flaws of the old Toxic Substances Control Act (TSCA) that were fixed in the bipartisan TSCA reform legislation, the Lautenberg Act, signed into law last June. Here are a few additional things to note. This bill is scheduled to be marked up next Wednesday in the Senate Homeland Security and Governmental Affairs Committee (HSGAC). I noted in my last post that RAA is sweeping in scope, and would affect dozens of federal laws and protections in one fell swoop. 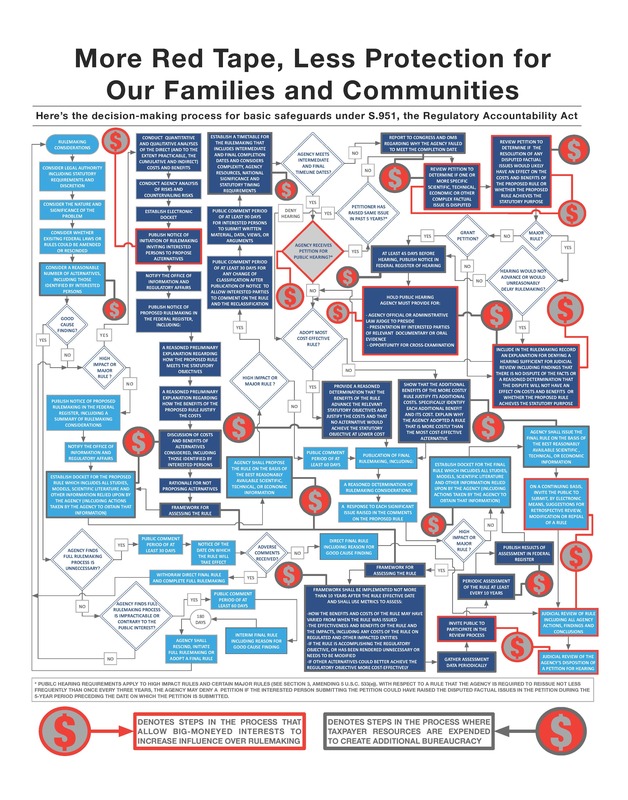 My colleague Martha Roberts has just put up a blog post that illustrates this incredibly broad reach by providing a few tangible examples of protections that would be at risk if RAA were to be enacted. 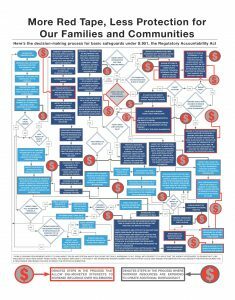 And talk about red tape: I’m including below her updated graphic depicting the vast bureaucracy RAA would create that all federal agencies would be forced to navigate (click on the thumbnail to enlarge it). This entry was posted in Health Policy, Regulation, TSCA Reform and tagged Lautenberg Act, Regulatory Accountability Act. Bookmark the permalink. Both comments and trackbacks are currently closed.